Three things are generally true of Tsutsui Yasutaka’s writing: it’s easy to read, it’s creative and fun, and it’s usually more about the concept than the characters. The Girl Who Leapt Through Time is no exception. The story is short, it’s entertaining, and the idea of time travel is more fleshed out than the characters. Junior high school student Kazuko hears a crash in her school’s science lab while helping her friends Goro and Kazuo clean up after class. When she enters the room to investigate, she smells lavender and passes out. The next morning, she and Goro are run down by a bus while rushing to school. Right before the bus strikes them, however, Kazuko opens her eyes and finds herself back in bed. She discovers that she has somehow jumped back in time to the morning of the previous day. Kazuko tells Kazuo and Goro about her strange experience, and they suggest that she talk to their science teacher, Mr. Fukushima, after school. Surprisingly enough, Mr. Fukushima listens sympathetically before explaining that Kazuko needs to jump back in time to the incident in the science lab in order to figure out what happened. She does so and meets Kazuo, who explains everything to her before erasing her memory and returning to where he originally came from. And that is the story. Nothing else really happens. Kazuo’s debriefing is interesting, but there is no on-screen adventuring or experimentation on the part of Kazuko. There is no narrative tension, just a bit of simple mystery solving. None of the characters really stand out. Kazuko is frightened and dependent on the help of others, Goro is childish and petty, and Kazuo drifts along without contributing anything until the last three or four chapters. The two other named characters, Mr. Fukushima and Kazuko’s friend Mariko, barely have any lines at all. Director Hosoda Mamoru’s 2006 animated adaptation is much richer in terms of storytelling and character development. 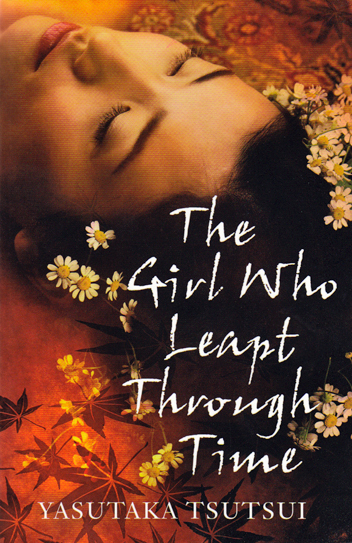 Still, The Girl Who Leapt Through Time is a quick and easy read that should appeal to a younger audience. A bit more interesting than the main novella is the shorter work “The Stuff Nightmares Are Made Of,” which is also included in the book. In this story, junior high school student Masako tries to get to the bottom of her fear of heights, which is somehow connected to the discomfort she feels around Prajna masks. Masako’s close friend Bunichi passes along what his therapist uncle tells him about the psychology of fear, and Masako uses this information to help not only herself but also her five-year-old brother Yoshio, who suffers from night terrors. The relationship between Masako and Yoshio is charming and sweet, as is the budding romance between Masako and Bunichi. If I had to guess, I would say that the two stories in The Girl Who Leapt Through Time are meant for kids who are a bit younger than their protagonists, despite the adult woman adorning the book’s cover. They’re both entertaining, simple stories for the age seven to twelve crowd. If you’re an adult reader in North America who can’t seem to find a copy of this British publication, though, you’re not missing much. The movie is definitely better. I actually just bought the DVD of the anime. Funny you should happen to review the novel now. Easily one of my favorite anime movies.